You’re putting out an album right? Tell us about some of the songs you’ve put together for the project and who all will be featured. I got about 5 records done. I got records with Dorrough Music, Paul Wall, Billy Blue, C-Ride. I got production from The Runners, CP Hollywood, House of Pain, Kane is supposed to give me some beats. I’m definitely using 3 of the records for the album. 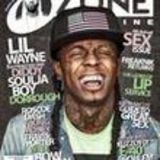 I got “I Be Out Here” featuring Triple Cs and Sean Paul of the Youngbloodz. I don’t have a name for the album yet, but I think I’m going for Street League. When I get about 7 records I’ll probably decide then. 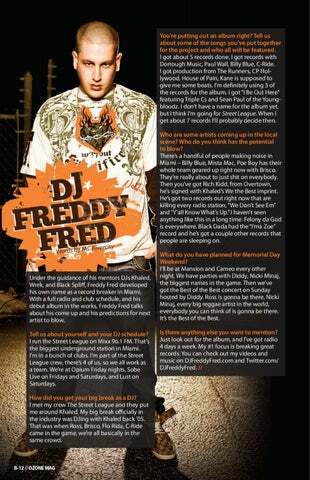 Under the guidance of his mentors DJs Khaled, Wrek, and Black Spliff, Freddy Fred developed his own name as a record breaker in Miami. With a full radio and club schedule, and his debut album in the works, Freddy Fred talks about his come up and his predictions for next artist to blow. Tell us about yourself and your DJ schedule? I run the Street League on Mixx 96.1 FM. That’s the biggest underground station in Miami. I’m in a bunch of clubs. I’m part of the Street League crew, there’s 4 of us, so we all work as a team. We’re at Opium Friday nights, Sobe Live on Fridays and Saturdays, and Lust on Saturdays. How did you get your big break as a DJ? I met my crew The Street League and they put me around Khaled. My big break officially in the industry was DJing with Khaled back ’05. That was when Ross, Brisco, Flo Rida, C-Ride came in the game, we’re all basically in the same crowd.